Strong women come in many forms. 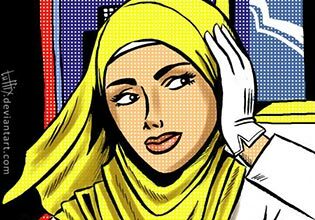 Using religious imagery and iconic poses like Norman Rockwell’s “Rosie the Riveter”, artist Saba Chaudhry Barnard created a powerful series of portraits of American Muslim women. 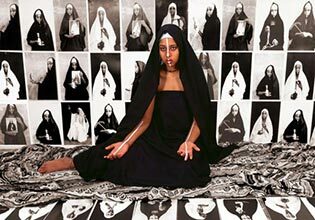 Through the portraits, the Pakistani-American artist celebrates the diversity, intersectionality, and strength of women, hoping to expand viewers’ understandings of Muslims and show a different power and diversity than what is typically depicted in mainstream media. An-Noor means “the light” in Arabic—through halos, fire, and gold used in the portrait series, Saba Chaudhry Barnard allows these Muslim American women’s inner lights to shine through. “An-Noor is a series of portraits of American Muslim women. The portraits demonstrate the diversity that exists amongst American Muslimahs, yet the paintings are not specifically about Islam. These humanist portraits are inspired by all sorts of religious imagery—be it ancient Egyptian or Hindu gods and goddesses, or Byzantine representations of Christian figures. They incorporate a strong feminist element—a feminism that is inclusive and recognizes that female strength comes in many forms. A first generation Pakistani-American woman, I was confronted by my “otherness” from a very young age, being a token of diversity at my private school in North Carolina. As a brown-skinned, big-haired, mosque-going, curry-eating, mustached girl who couldn’t date, eat bacon, or wear shorts, I was the token of diversity at my private school in North Carolina. I envied my blue-eyed, blonde-haired, pop-collared, seer-suckered, church-going peers who vacationed on islands. I assumed that these were the sorts of things that really mattered.For years, I tortured myself trying to blend in, trying to stand out, trying to “find myself” within these little boxes. But it’s impossible. Instead, I make art that is, I hope, less categorized and reductive, reflecting that the boundaries we create between us and inside of us are, in fact, an illusion. 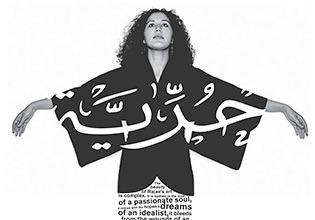 So my work is not so much about defining Muslim women, or anyone, but undefining them. About undefining ourselves and connecting to that universal something that exists within all of us. That “something of the eternal.”As I move forward, I am attempting to show this universal something through an increasingly emphasized combination of geometric and organic design, communicating meaning through the use of these flat forms. I feel that this is a further exploration of my heritage, incorporating Islamic art’s emphasis on geometric pattern with the colorful, flowering, curled lines of South Asia, balanced and integrated within a contemporary American context.